Want the chance to grab yourself an exclusive print by the one and only Mancsy? 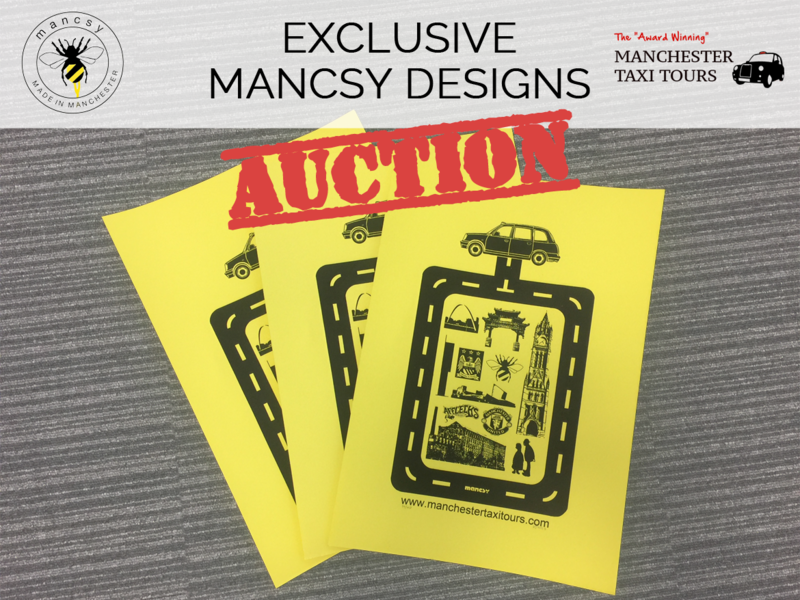 In partnership with Manchester Taxi Aid, an organisation formed by our very own John Consterdine and Ian Reid MCR Blackcab Ltd, we’re auctioning off THREE Mancsy exclusive designs. Manchester Taxi Aid aims to raise awareness of regular exercise to taxi drivers and to raise funds for Lancasterian School. This is done through using the Great Manchester events, most recently the Salford 10k, and raise money for the charity through sponsorship. To help towards the cause, Manchester artist Mancsy has designed some limited edition prints, exclusively for Manchester Taxi Tours. Only 40 of the prints were ever made, and we’re auctioning three of them off to charity. The proceeds will be split evenly between the Lancasterian School in West Didsbury, and the amazing Booth Centre, which helps homeless people who especially need our help through these tough, cold winter months. We will be running the auction over on our Facebook page here, so be sure to ‘Like’ the page in order to keep track of the bidding. If the winning bidders are in the Greater Manchester area, we can deliver the prints free of charge. We will accept PayPal or cash payments, and if you have any other alternative payment methods you would prefer, please let us know.